Though I’ve written about 007-related matters quite a few times on this here site, including the matter of Bond and booze, I actually haven’t seen “Spectre” yet. 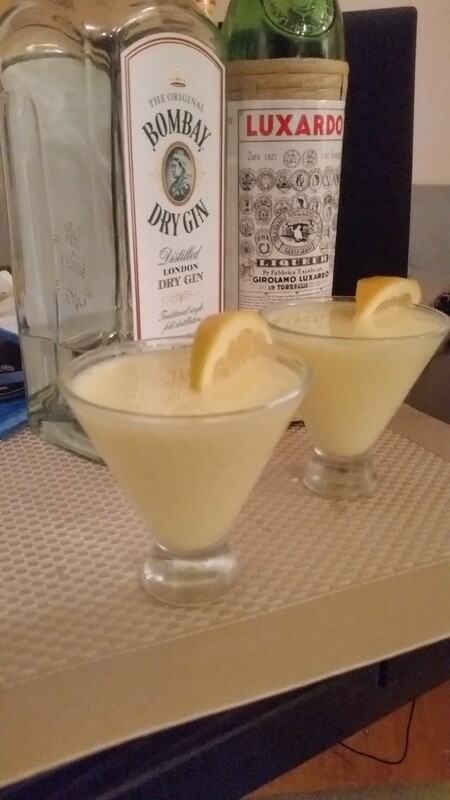 Combine the gin, juice, liqueur, egg yolk and sugar into a cocktail shaker. Dry shake (shake without ice) to emulsify the yolk. Add ice and shake again very vigorously. Strain into a chilled cocktail glass. If the oranges from your supermarket are sufficiently sweet, consider adding a slice for a garnish. If not, don’t sweat it. There’s enough going on in this drink. For the record, the original version of the Casino Royale, which I found on various web sites, contains only one teaspoon of maraschino and no other sweetener of any sort. That version is not for everyone and I’m not even sure it’s for me. On the other hand, it’s definitely less fattening and great for people who don’t mind very tart drinks softened by an almost yogurt-like softness, courtesy of the egg yolk. Still, though it might be less kind to my waistline and my A1C, I like my sweetened up version. It worked very well with a few different gins. Bombay Dry, Plymouth, and value-priced Gordon’s all produced dandy results, lending the drink the right floral/boozy backdrop. I also had good results with both Maraska and Luxardo maraschino. The latter was more sweetly inviting, with a vaguely vanilla-esque back-taste. Luxardo added more overtly complex flavors in ways I simply don’t have the vocabulary to fully describe right at this moment, other than to say it was kind of interesting. Now, it’s time for an appropriate musical interlude from one of the worst spy movies with one of the best scores not composed by Sir John Barry. This was the recipe I’d always planned to do right around now. By “now,” I originally meant before the release of the first James Bond movie in several years and/or right around the 50th anniversary of the 007 film series. Even so, I managed to miss the fact that the opening weekend of “Skyfall” was last weekend and not this weekend, so we’re a bit late. This despite the fact that I and my Bullz-Eye compatriots have spent — and are spending — a fair amount of time actually writing up the Bond films for this very blog. (Check out the Bondian fan hub here.) Fortunately, the movie is turning out to be the most successful film in the uber-franchise in a long while — how long probably depends on whether you bother to adjust for inflation — so it’s going to be around awhile. That means the Bond celebration will also continue. The Vesper, I should say, is a tricky and ironic drink among late period cocktail classics. Since it debuted in the very first James Bond novel,1953’s Casino Royale, and was created for 007 author Ian Fleming by his friend, Ivar Bryce, a fellow real-life spy, the supercool authenticity factor is off the charts. The scene in the 2006 film version where Bond finally orders the drink some 53 years after it was first invented was a special treat for diehard spy fans and cocktail lovers, and I’m both. The downside here is that there are issues relating to the ever formulating changes in booze brands that has made the idea of the Vesper a bit more enthralling than the actual drink usually is. We’ll get to those, and a bit more history, after the very, very strong recipe below. First, however, a word to wise boozer. If you drink a whole Vesper, you really should be done for the night. Mere mortals should not drink like functioning dipsomaniac superspies. You may want to consider cutting the portions here in half or pouring this drink into two glasses for you and a friend. Combine your ingredients in cocktail shaker with a sufficiency of ice. Though heretical cocktail snobs will tell you to stir, this is an Ian Fleming cocktail and Mr. Fleming would certainly have you shake the drink. Strain into a chilled cocktail glass or, if you really want to be classical, do as Bond asked the barman in the novel and serve it in a deep champagne goblet. Add your lemon twist, sip and surrender your car keys to the nearest trustworthy soul. Watch out for double agents. In the scene in the novel (included in the wiki I linked to above), CIA agent Felix Leiter expresses some skepticism about the as-yet unnamed Vesper, which Bond later names for the first of his two true loves, Vesper Lynd. It is a very big drink and not for pikers. It also a drink that, as cocktail historian David Wondrich and many others have admitted, hasn’t aged terribly well for a number of reasons. First of all, all the ingredients have changed. Bond specifically requests Gordon’s Gin. Though it’s no longer considered on the high-end of the gin scale, I actually quite like today’s value-priced Gordon’s, but the flavor of today’s version can’t be the same as was back in ’53. Gordon’s is now only 80 proof. Back then, it was a higher proof and most, Wondrich included, now suggest using Tanqueray. This time around, I used the similarly high proof Beefeater, which seemed a bit more classical. As for vodka, Wondrich and others seem to assume it would have been 100 proof. At $26.00 a bottle, I’m simply too cheap to buy 100 Stolichnaya, so I went with the $16.00 100 proof Smirnoff. I’ve never really been sold on Stoli and I doubt Bond or Mr. Fleming would have drunk a communist vodka. Moving down the list of ingredients, I love Lillet Blanc. In fact, maybe my favorite thing about the Vesper is that it introduced me to this intriguing aperitif wine and occasional cocktail ingredient; it tastes like dry vermouth and sweet vermouth made love and birthed an independent-minded female child. However, it also apparently isn’t what it once was. Mr. Bond’s original recipe calls for the now long-gone Kina Lillet, which we are told had a bit more quinine than the present day Lillet Blanc. That leads us to the use of the bitters, which are an attempt — some would argue a rather lame attempt — to compensate for the low level of quinine. Folks with more time and money than I have been known to actually purchase quinine powder. Since I’m not fighting a case of malaria right now, I chose not to. So, what do I think of the Vesper? I’ve made this drink probably 10 times over the years and ordered it a few times in bars and, with a couple of exceptions, I’ve been disappointed in the taste while always enjoying the effect. A regular martini, either of the gin or vodka variety, will usually go down more pleasantly. Even so, if you want to drink the one drink that James Bond created on the spot, well, you’ve got no other choice. You’ll drink it and, by the time you’ve finished all that booze, you’ll like it. In any case, it’s only human to want to try the drink James Bond made up. What kind of drink do you want on Labor Day? Something so strong it’ll make you lose all ambition and forget you even have a job? Maybe you’d be better off with something so delicious and sweet it’ll make you glad you have some hard-earned sheckels and can actually afford some decent booze, but not so heavy duty with alcohol it’ll dehydrate you in the late summer heat or blitz you out to the point that you’re going to have to call in sick on Tuesday morning. So, we turn to a variation on a genuine cocktail great, the Americano. This version substitutes Campari with Aperol, another liqueur from the same Italian manufacturer which only recently has become widely available on our shores but which I understand has been delighting Europeans en masse since some time not long after Benito Mussolini was given his eternal walking papers. 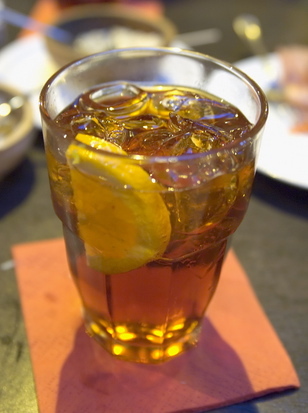 Aperol is something like a kinder and gentler lower alcohol variation on the super-sweet and super-bitter one-two punch of Campari. While I love it’s more potent cousin, Aperol is, on its own, a drink with just enough bitterness to underline its delightful sweetness. Using it in an Americano turns into a super refreshing beverage that’s as user-friendly as anything, but just complex enough, I think, to placate a not-too hardbitten cocktail snob. It’s worth a little labor, but making this drink is about as easy as drinking it. Add the Aperol and vermouth to an old fashioned glass with plenty of ice in it and maybe an orange slice or chunk. Top off with soda. Now here’s the difficult part — stir. You might consider toasting the hard working members of organized labor who helped you get that weekend you’re currently enjoying so much. When I wrote about the Americano just slightly under a year ago, I described it as “a perfect drink for lightweights” despite the fact that I also noted it’s the first drink ordered by none other than James Bond in none other than the first James Bond novel, “Casino Royale.” Considering that lower alcohol content of Aperol vis-à-vis Campari, I guess this would be an even more perfect beverage for lightweights. If that’s a little too perfect for you, it’s perfectly acceptable to do what I did and increase the Aperol and vermouth to 1 1/2 ounces each and make the drink in a somewhat larger Tom Collins/highball glass. It’s way good and it still won’t remove you from the workforce.